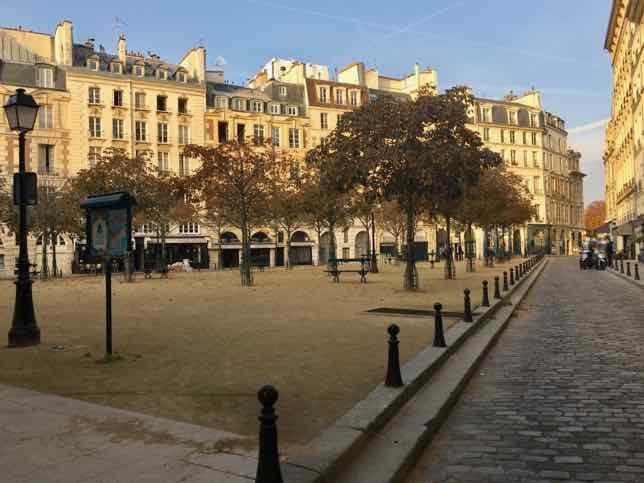 When you visit Paris there are many opportunities to see the sites and learn about French history: bus tours, walking tours, and bicycle tours. But what about running through the streets of Paris with a tour guide? Why on earth would one want to do this? What better way to get some mileage in, be challenged to keep up one’s pace, see the sites over a large area of Paris, and hear some good stories along the way! Recently I had the opportunity to do so with Paris Running Tours. Taking a running tour is much different than doing a running race or going for a quick run on your own in Paris. Put simply, I didn’t realize how much I did NOT know about Paris even after countless visits. I saw many things I had passed by often and had never given them a second glance. The more you learn about Paris, the more you realize you don’t know Paris. 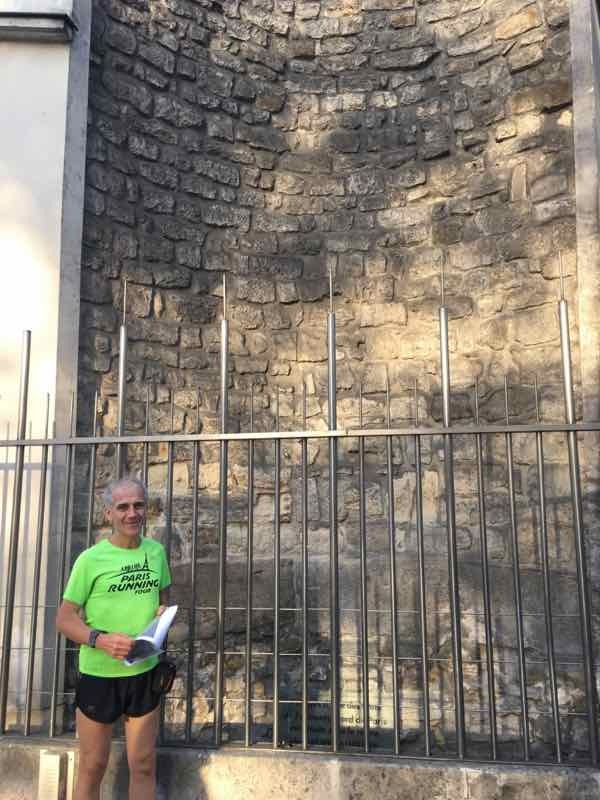 Paris Running Tours is owned by Jean-Charles Sarfati who has been running for the past 22 years and has done many running races in France and throughout the world including the Paris Marathon and New York City Marathon. 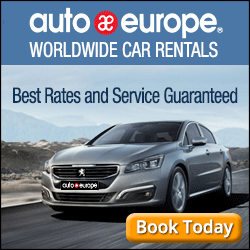 The company has been in operation since 2008 and the guides speak French and English fluently. (There is also a guide who speaks Spanish). There are three tours (8 km, 14 km, and 20 km, taking 1, 2 and 3 hours respectively, although it’s the distance that is guaranteed). What’s unique is that the tour is private and the running route is customized for you, starting from where you are staying. You choose the date and time, so the run fits into your schedule. 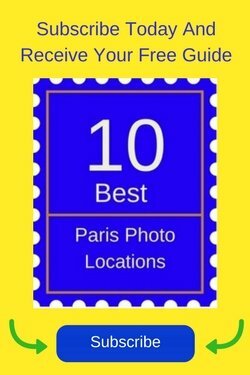 In advance of the tour you are sent documents with the suggested itinerary (running route) and photos or images of Paris. During the tour, the guide will have a camera to take pictures of you and a map to show you where you are at each stop. This map will be given to you at the end. And after the tour, the guide will send you an email with the photos and any interesting links. I can honestly say I had an amazing time. One of the reasons was because of Jean-Charles. He is passionate about Paris and knows so much about the history of Paris and France. His excitement and love for Paris is contagious. He loves the city and it shows. To be honest, I was worried I wouldn’t be able to keep up. 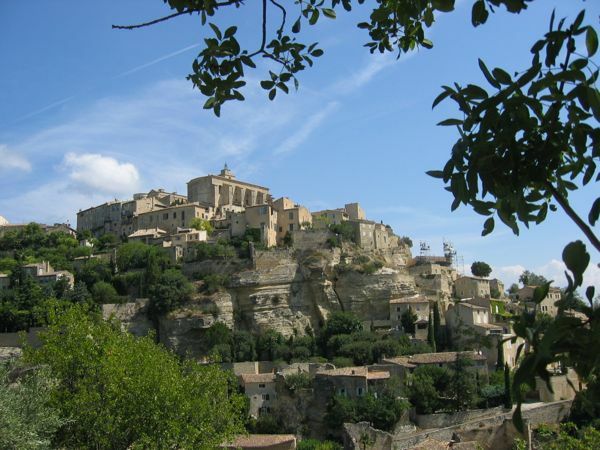 Even though I am a runner, during this particular trip to France I had not run once in 8 days. I had only walked a lot or hiked before our meet up, so I was concerned I would not run well. That worrying was all for naught. When we ran (at a good pace) it was in short spurts because we would come upon a site, stop and Jean-Charles would tell a bit about its history and significance. So the 7.5-8 km run that I did was more like interval training, which was just as good. I was able to catch my breath when needed. For those who are concerned that they might not be a good enough runner, I would say don’t worry at all. Whether you call yourself a jogger or a runner, you’ll be getting a personalized run and the guide will adapt to your pace and make stops as you need them. You’re not just getting a run, you’re getting a running sightseeing tour of Paris so you’ll be learning along the way. As Jean-Charles rightly pointed out, when you are on a walking tour, you don’t necessarily cover the large territory that one can get when running. 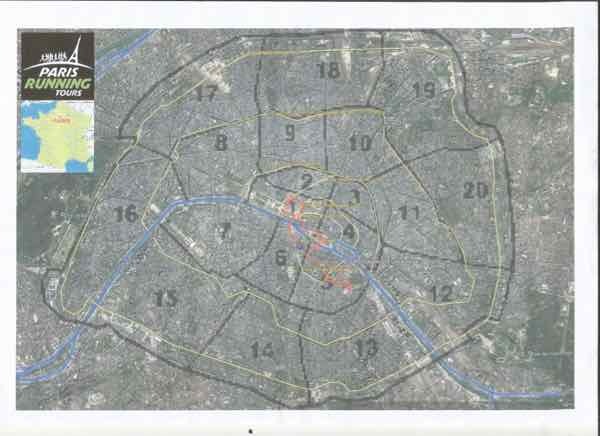 As you can see from the route, we ran through 4 arrondissements (neighbourhoods) of Paris. 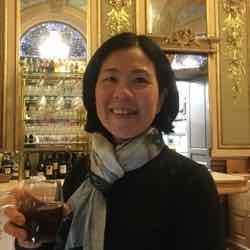 Even on bike tours that I have taken I have not gotten the in-depth descriptions that Paris Running Tours was able to provide. 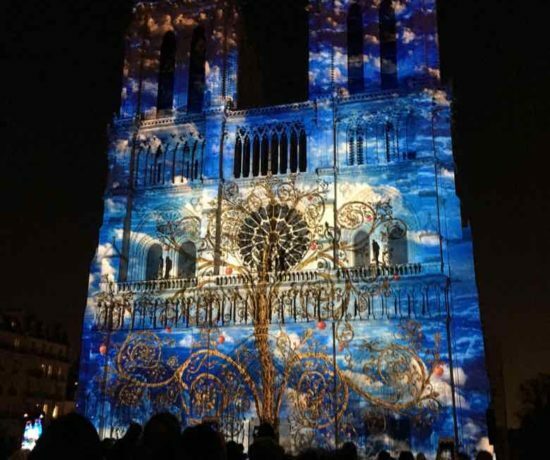 I actually remember thinking during my bike tour that I wanted to hear more about the history of Paris. With a running tour, you’ll get that. Paris Running Tours running route. 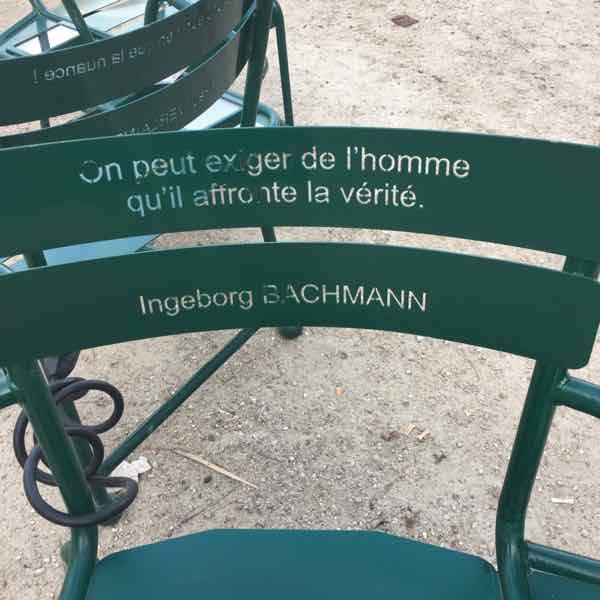 Recently some park chairs that you often see in Luxembourg and Tuileries Gardens were installed in the garden at Palais-Royal. But not just ordinary green iron chairs. 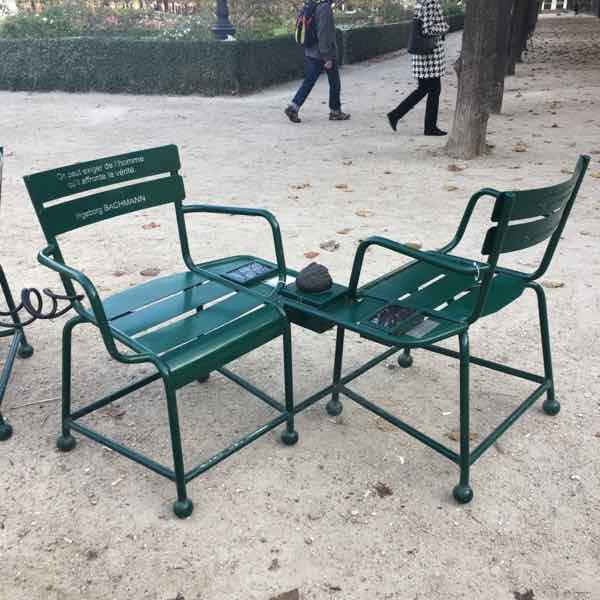 There are 10 sets of chairs placed in groups of 2 or 4 like love seats and have an audio input where you can plug in your headphones and listen to a French poem! How cool is that? The poem I listened to was short and very clear. Quebec sculptor Michel Goulet installed the exhibit called, ‘Les Confidents” (The Confidants) and it will remain permanently in the garden. You can’t go running in Paris without stopping at Notre Dame. The cathedral was constructed between the 11th and 13th centuries and there are biblical stories depicted throughout the structure. Sadly, throughout its history much of the cathedral and its statues were damaged and during the French Revolution the statues were beheaded. The Revolution was against the church and sought to abolish the Catholic monarchy. The heads of those statues were found in the 1970s at an excavation site and are now housed at the Musée de Cluny. Which Way? Heaven or Hell? 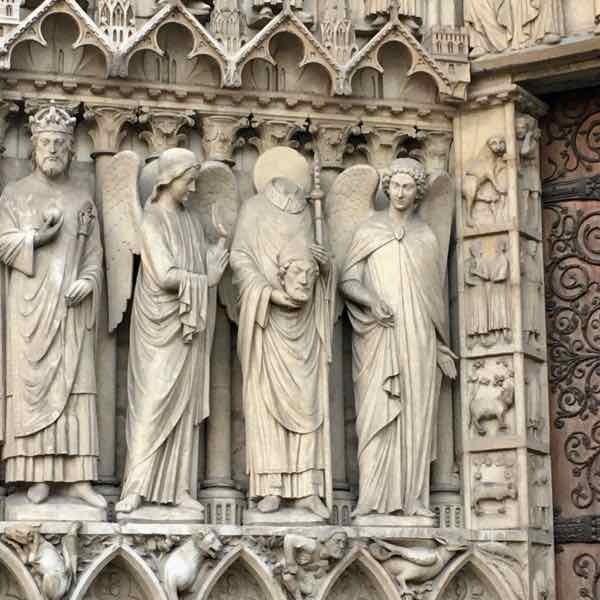 In the western facade of Notre Dame, the portal of the last judgement shows archangel Michael weighs the souls of the dead and decides which way they will go: to heaven (to the left) or to hell (to the right). The statue of Saint Denis shows the saint holding his head. He was a martyr and saint in the 3rd century and the story is that after being decapitated by the Romans, he started walking north, preaching a sermon, with his head in his hands to a place where he finally died. That place is now called Saint Denis. One of the stops we made during the tour was on Rue Saint-Séverin. Jean-Charles pointed out the current sign (in blue) and the original carved marker. As you can barely see, the word Saint or St. has been scratched off. Why, you ask? 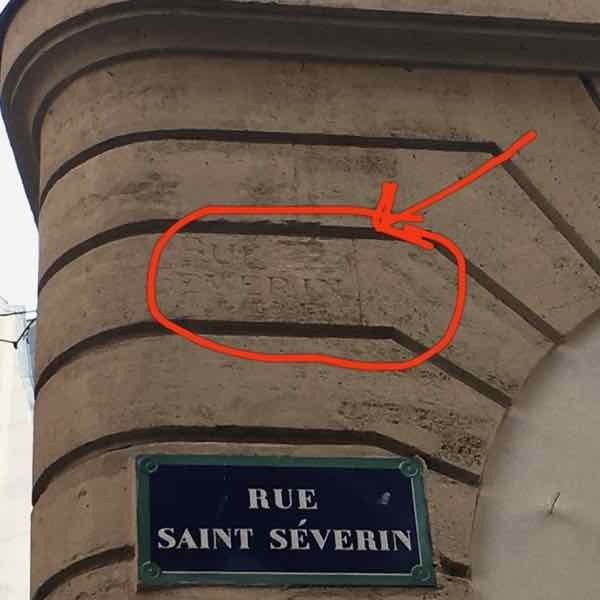 Rue Saint-Séverin is one of Paris’ oldest streets, constructed in the early 13th century; however after the French Revolution in 1789, any mention of religion, such as the word, “Saint”, was removed. During different periods in Paris’ history, from Roman times to the 19th century, rulers have constructed fortifications not only deal with the expanding city but more so to protect it from invaders or to collect taxes. While not all the walls remain, some do, notably the wall of Philippe Auguste (1190-1213). 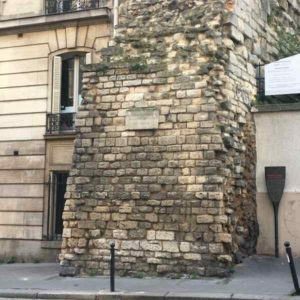 Paris was encircled by three walls and remains of these walls can be found throughout the city. I saw remnants of the wall of Philippe Auguste the most as our route stayed within the 1st, 2nd, 5th and 6th arrondissements. Some were against a building, ending at the sidewalk and some were in the parking garages on the left bank. I couldn’t believe that parts of walls from over 800 years ago would still be in existence! 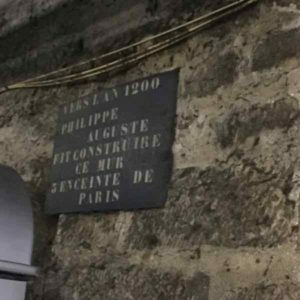 This tour only exposed me to one part of Paris. I would definitely do another one and run through another part just to learn more about its history. 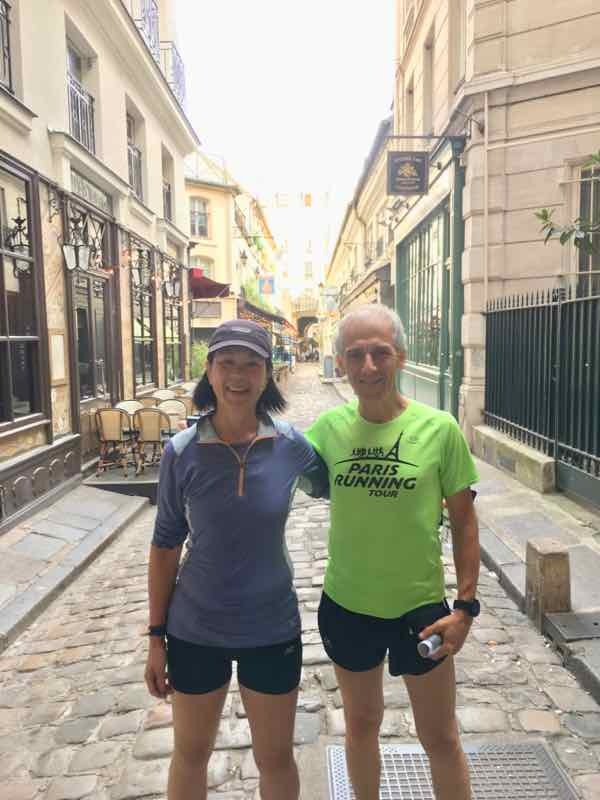 Paris Running Tours did a great job on showing me new aspects of Paris. Thank you to Paris Running Tours for providing this unique experience. As always, all opinions are my own and reflect my experience on the tour. 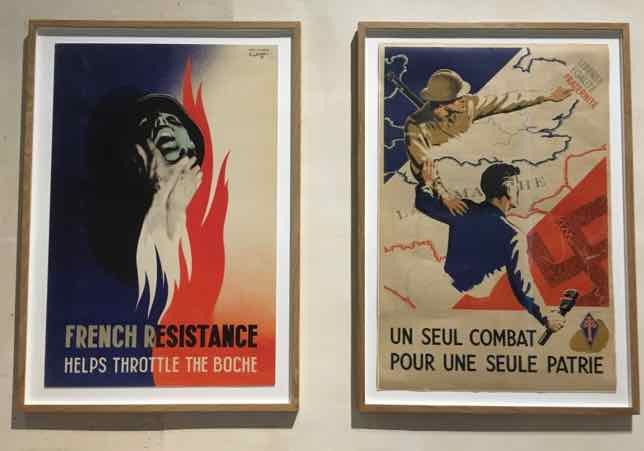 If you’re interested in “history-based” tours, be sure to check out my post about Paris Greeters—a voluntary organization that gives free walking tours: Paris Greeters–A Free Walking Tour Worth Taking. Such a great idea and another perspective of a city you’ve visited many times. 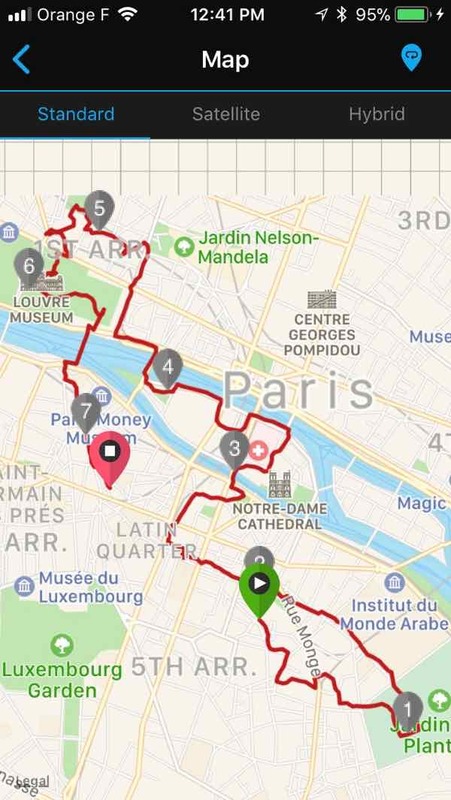 As a history buff, I love the fact that the guide wove in some of Paris’s history throughout your run and pointed out things that the casual visitor would miss. And receiving pictures, a map of places you covered and links with more info after your tour is a wonderful touch as well as a terrific way to remember your run! Yes it was great that Jean-Charles provides all clients with the map and links. Now I’m even more curious to find historical places in Paris.